Slot head; Price 2,600 gp; Weight 1 lb. This black leather tricorne hat is weather-beaten and saltstained. It grants its wearer a +2 competence bonus on Profession (sailor) and Swim checks. If Besmara is your patron, once per day you can speak a command word to transform the hat into a small ship’s boat such as a cutter, jolly boat, or longboat (see the Skull & Shackles Player’s Guide). The boat is 20 feet long, has two pairs of oars and a single mast with a square sail, and can carry up to 12 passengers and crew. Upon command, or after 8 hours, the boat returns to hat form, dumping out any occupants. 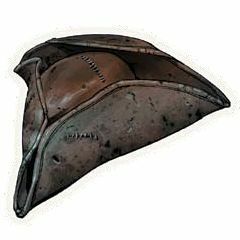 Besmara’s Tricorne belongs to Sandara Quinn.